Harriman's absentee boyfriend dumps her, precipitating a brief fling with Hart, who has trouble recovering. Soloway channels Sir Thomas Moore - or does he? Solloway thinks he's Sir Thomas More.....so you think maybe they were running out of ideas??!! 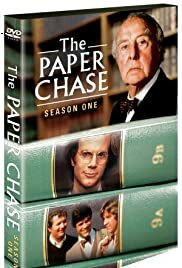 While "The Paper Chase" has long been one of my favorite television shows, when I re-watched "A Wounded Hart" it felt to me like the series had jumped the shark. In other words, its best programs were behind and the writers were scrambling for ideas...and had resorted to a ludicrous one...which makes this a very disappointing view. There are two plots in this one...the kinda dumb one and the REALLY dumb one. First, the kinda dumb one. Harriman and her long-time boyfriend have been apart during their graduate schools. Now when he comes for a visit, however, he's there to call off their relationship. Vulnerable and on the rebound, she finds herself in bed with Hart!!! Now considering how much they argue, this seemed quite farfetched. As for the REALLY dumb one, Solloway thinks he was Sire Thomas More in a previous life!! This sound stupid as I write it...and it was. It's a shame because the first plot, though hard to believe, did bring up some interesting things and ALMOST make the episode worth seeing.